This best-selling title provides in one handy volume the essential mathematical tools and techniques used to solve problems in physics. It is a vital addition to the bookshelf of any serious student of physics or research professional in the field. The authors have put considerable effort into revamping this new edition. 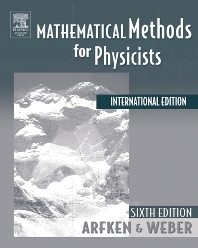 This title is excellent for its comprehensive coverage of mathematical physics topics.